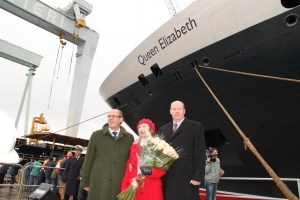 Cunard’s President and Managing Director, Peter Shanks, was joined by 79-year old Florence (Dennie) Farmer who was guest of honour at the event. Dennie’s husband, Willie Farmer joined Cunard in September 1938 and served as Chief Engineer on both Queen Elizabeth and QE2 until retirement in October 1979. Since her husband’s death Dennie’s link to the two previous Queen Elizabeth ships is unparalleled. In recognition of this Cunard has bestowed on Dennie the honour, in Italian tradition, of being ‘Madrina’ to the third Queen Elizabeth. Special ceremonies where held at Fincantieri’s Monfalcone shipyard on Tuesday 5 January to celebrate the float out of Cunard’s newest ship Queen Elizabeth. The ceremony involved welding significant coins beneath the mast of Queen Elizabeth for good luck. 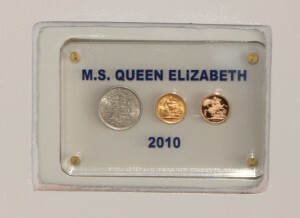 A total of three coins were chosen – a half crown which is dated 1938 (the year the first Queen Elizabeth was launched); a sovereign dated 1967 (the year QE2 was launched) and a sovereign dated 2010 to acknowledge the fact that the new Queen Elizabeth is being floated out in 2010. The focus then moved to the dockside where the ship was blessed, and a bottle of Italian prossecco smashed against the hull by the Madrina. The valves of the dry dock opened and the ship met the water for the first time. “It is only a little over six months since the keel for this great ship was laid. In that short time a solitary block at the bottom of the dry-dock has, as a result of the skill and discipline of the workforce here at Fincantieri, grown into this awe-inspiring vessel. “Even in her present unfinished state, devoid of the carpets and curtains, furnishings and facilities, paintings and porcelain that we associate with a Cunard luxury liner, she is awesome. “Of our 170 years of history there has been an ‘Elizabeth’ in the fleet for over 70 and this ship – the second largest Cunarder ever built –will take the name far into the 21st Century”. Queen Elizabeth will feature a number of Cunard traditions linking her to the grand ages of ocean travel, together with all the modern day luxuries. There will also be unique features that will give the vessel her own style and personality. Queen Elizabeth with adhere to Cunard’s traditions with distinctive black and red livery exteriors, with elegant public rooms, luxurious rich wood panelling, intricate mosaics, hand-woven carpets, gleaming chandeliers and cool marbles to make her a true Cunarder. Queen Elizabeth will acknowledge to the links that Cunard has enjoyed with royalty and the maritime world over the years with photography, memorabilia and exhibits. Queen Elizabeth will depart on her Maiden Voyage on Tuesday 12 October 2010. This 13-night celebration will leave from Cunard’s home port, Southampton, and will call at Vigo, Lisbon, Cadiz, Las Palmas, Santa Cruz de Tenerife (overnight call) and Funchal. This is the same itinerary that her predecessor QE2 took for her maiden voyage over 40 years ago.